From the moment Bryce Harper signed his $330 million, 13-year deal with the Phillies, this game is the one everyone has been thinking about: Tuesday night marks Harper’s initial visit to Nationals Park to face his former team. What will the crowd’s reaction be the first time he steps to that plate in a uniform other than Washington’s? What sort of tribute will there be from the Nationals? What sort of gesture will the outfielder himself make? 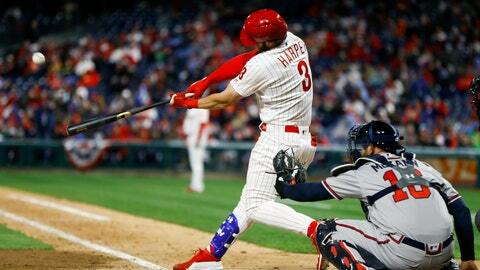 And how will Harper, who loves the spotlight, fare in the reunion — especially against Max Scherzer? Philadelphia enters as baseball’s only undefeated team, 3-0 after pummeling the Braves at home — an effort helped by two long home runs from Harper. The Indians have sent All-Star shortstop Francisco Lindor for a second opinion on a left ankle injury that could be more serious than first believed. Lindor was in Green Bay, Wisconsin, on Monday, visiting foot and ankle specialist Dr. Robert Anderson. Lindor injured his ankle while playing in a minor league game last week. The Indians initially diagnosed the injury as an “acute sprain” but sent Lindor to Anderson for a second look. Cleveland sure could use him in the lineup. The team has scored 10 runs through four games this season, batting .164 with a .485 OPS. With Giancarlo Stanton and Miguel Andujar hitting the injured list Monday, nearly half of New York’s starting lineup is on the sidelines four games into the season. Stanton strained his left biceps taking a swing Sunday, and Andujar suffered a small labrum tear in his right shoulder diving into third base on a pickoff attempt. Stanton will rest for 10 days and be re-evaluated, but could miss most of April. Andujar will get treatment for a couple weeks, but there’s a chance he’ll need season-ending surgery. Red Sox lefty Chris Sale makes his second start after getting thumped by Seattle in Boston’s opener. Sale allowed seven runs and three homers over three innings, looking rusty after getting a lighter workload in spring training. The Red Sox hoped that limiting their starters early might make them more effective late in the year, but Sale, Nathan Eovaldi, Eduardo Rodriguez and Rick Porcello all got hit hard the first time through the rotation. Sale will face Oakland’s Mike Fiers (1-1, 5.00), already making his third start this season, including during a two-game series in Tokyo.